Murkkit crouched on the floor of the strange den, his slitted eyes watching the outside world with suspicion. His tail twitched from side to side behind him, brushing over bits of moss as cats padded by the weird bush he had been forced to spend his time in. This place was too strange, there were too many cats, and the one who was supposed to be feeding him had fallen asleep - not that he was hungry anyway, but still. There were other kits, but they were all she-cats, and most of them were squeaky and bumbled around doing something they called play. He wrinkled his nose and continued staring, resting his head on his forepaws. Bush... Stupid thing had disappeared somewhere, and hadn't come back. Like the tom that had brought him into this strange place, except he'd actually seen him from a distance a few times. To make it all worse, they'd stopped him from getting out this shrubby thing the couple million times he'd attempted to get out, their voices admonishing him with words he could barely understand, except for that "no" one, along with the one "weak," which he thought probably meant staying somewhere or something. He'd gotten better with the words, and he could understand a lot of them now, but all the cats were still strange, and they would probably still stop him from escaping, if he tried. Blinking deliberately slowly, he continued watching. He'd been crouching there for who knew how long, his eyelids gradually drooping into an utterly bored glance that probably would have made any cats who'd been around to see it a little uncomfortable. Finally, they closed, and he fell into the strange murkiness of dreams. An orange tabby who called himself Finchpaw slowly made his way into the nursery. An odd place for an apprentice to be, but Finchpaw needed to gather up his old bedding and move it outside, as he was no longer a kit. With a grin, he realized how small the nursery seemed now, having grown a bit since his kithood, Finchpaw felt as if he soaked up all of the little space there was, feeling very crowded. As the tom lowered his head to gather up his old bedding, he noticed a lone tom kit, locked into a strange sleep. Did another queen give birth? Finchpaw thought, wondering where this new kit came from. He cocked his head curiously, yellow eyes glowing in the gloom. Dropping his moss, Finchpaw padded over to the dark mass of fur, standing over him. He doesn't smell like Windclan... The tom realized, wondering if Brindlestar had decided to take in another loner kit out of sympathy. Not that Finchpaw had a problem with it, if he was in her position, he'd be quick to do the same. Narrowing his eyes, Finchpaw felt a pang of understanding for the kit, with no mother to look after him. I know how he feels... My mother left me alone a moon after birth to return to her warrior duties. The apprentice smiled slightly, exhaling. He decided he wanted to know this kit, hoping to make a friend. Finchpaw extended a paw and gently prodded the kit on the shoulder, awaiting a response. "Hello there." Finchpaw dipped his head, "I couldn't help but notice your residence. Who are you?" Murkkit startled, his yellow-hazel eyes blinking open in abrupt jerks. Something had poked him in the shoulder. What...? He blinked up at the orange tabby who was standing over him, smiling, and narrowed his eyes slightly as the tom asked him a question. "Murkkit," He replied, his voice chirping strangely in a way that he wasn't sure he was happy with. That was when he realized he'd somehow managed to fall asleep in a crouch, and his legs had gone numb. "My legs are dead," He added in the strangely casual way kits seemed to have when discussing very strange things. "What about you?" "My legs are quite fine, thank you." Finchpaw mewed, without skipping a beat. He cocked his head slightly, wondering if the kit's legs were deformed or paralyzed. But taking a closer look, the apprentice realized with a snort that his legs had probably just fallen asleep from the kit sleeping on them funny. Dead legs... Finchpaw smiled to himself, amused by Murkkit's way of speaking. "What are you doing in here all by yourself?" Finchpaw asked, curious. He cast a glance to the opening in the bush, watching the other kits outside play. He wondered if Murkkit was shy, or just nervous being around clan cats. Finchpaw was still riding on the assumption that the kit was a loner, taken in to camp by some sympathetic queen or caring warrior. The orange tabby found a seat next to the kit, lowering his belly to the ground and stretching his legs out in front of him, so he could be at Murkkit's eye level. "If you don't mind me asking, where do you come from kit? You don't carry much Windclan scent on you, were you a loner?" Murkkit blinked at the other tom's questions, attempting to shift his weight a little so his legs would get some feeling back into them. "They didn't want me to go." He flattened his ears as he cast a quick, resentful glance at the happy, not-stuck-inside-for-some-weird-reason kits. Though, admittedly, it had been a while since he had last tried to get out. "My bush," He replied to the other tom's question, shifting uncomfortably at the feeling in his legs which vaguely resembled being stabbed with thorns. "What's a loner? 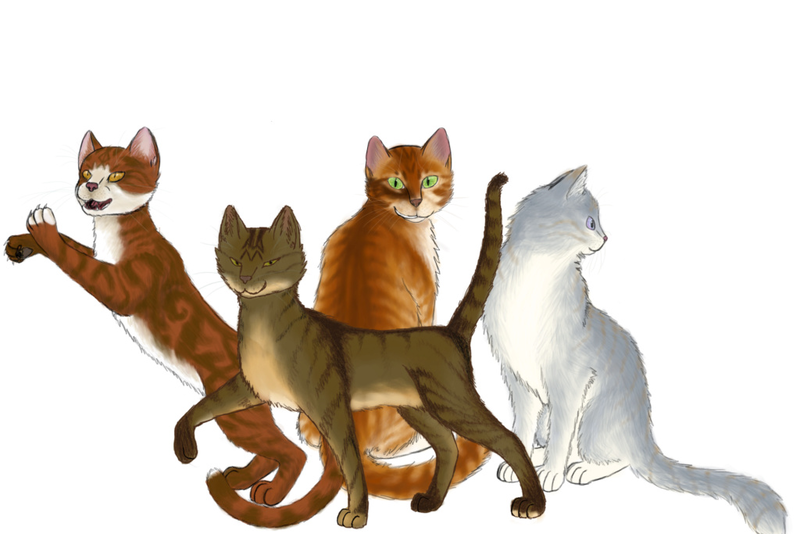 And what's WindClan, anyway?" Finchpaw cocked his head at Murkkit's question, opening his mouth to answer the kit, then closing it, hesitating. The kit definitely wasn't Windclan, but seemed to not know where he came from either. The orange tabby started to wonder who had found the kit in the first place, and why they weren't here. Has no one told him where he is? Finchpaw thought, brow furrowed. Realizing he had fallen silent, Finchpaw set his focus back on the dark-colored kit, deciding that he was well and able to explain the clan of the moors to the little tom. "You're in Windclan right now, in the nursery. Not to alarm you, but outside this bush, there are a lot of cats who live here. All of very decent character, and who will bring no harm to you, I can promise you that. We all live in a rather large camp, under the stars. There's a code we all abide by, and a ranking system along with that..." Finchpaw sighed, twitching his whiskers. Being born into Windclan, the apprentice had known how clans worked all his life, but he couldn't possibly began to imagine how confused the poor kit must feel. "Forgive me, you must be lonely. Were you born in a bush like this one?" Finchpaw thought back to the kit's earlier comment of a bush. The apprentice figured that Murkkit could be commenting on his last memory, or the last time he was comfortable. He felt a pang of sadness for the dark tom, away from his family, in a camp of strangers. On a whim, Finchpaw decided that if Ryecloud didn't have anything for him to do today, that he would stay and keep the kit company for the evening, wanting him to feel welcome. The apprentice rose into a sitting position, contemplating Murkkit's words. From what Finchpaw could tell, the talk of "the bush" seemed to stir the young kit, and the tom decided he wouldn't press any further, not wanting to upset him. Best to focus on the now... The tom thought, knowing that sadly, Murkkit would probably never return to the bush he spoke of. The two cats were silent for a minute, watching as the other kits tumbled with each other outside of the gorse. He glanced at Murkkit from the corner of his eye, head still facing the nursery exit. An idea sparked in his mind, and Finchpaw stood up, tail flicking. "Are your legs feeling better? Would you like to go on a little adventure, around camp?" The apprentice knew the kit was still small, but thought that maybe a walk could help him get his bearings, and feel less lonely. He looked up as the other tom stood, and pricked his ears at the question. Flexing his limbs, he cautiously rose to his paws, feeling only a faint tingling sensation. "They're fine." Murkkit looked out the entrance to the den, his tail twitching behind him. This cat thinks I can go out.... "Yes." And then he darted out like all the foxes in the forest were on his tail, his ears flattened to his head. Blinding light greeted him, and he immediately stumbled to a halt, crouching slightly as he blinked narrowed eyes around at the world. Although the light was reddish and would have been dark and murky to the other cats, it felt as though it was searing his eyes, since he'd spent almost all his time in the even darker nursery. Then he noticed the cats, large ones, huge ones, and ones almost as small as him all scattered throughout the clearing. He straightened, his tail waving behind him like a stubby flag as he regarded everything. Finchpaw followed the kit more slowly, amused by his quick dash from the tunnel. He came to a stop beside the dark tom, wrapping his tail around his paws. "What do you think?" Finchpaw questioned, dipping his head slightly lower to watch Murkkit's expression. The orange tabby and the dark kit sat side by side, taking in the awe of Windclan camp. Finchpaw hadn't looked at his home this way in a long time. Through the eyes of a kit. To Murkkit, the warriors must seem so huge, the hills tall, and the wind harsh. But to Finchpaw, it was the cats that he cared about the most. His deformed mentor Ryecloud, strong and determined. His best friend Brookpaw, as elegant as the wind itself. The apprentice told himself then that he would never take these cats for granted. And he always hoped he could look at them as a kit would, full of awe and wonder. He felt there was something special about that. As the harsh red sun drenched the two in a hazy light, he wondered what Murkkit thought. And if he would ever feel as close to these cats as Finchpaw did. It made the orange tabby want to be this cat's friend, and hopefully help him find more friends as well, if at all possible. Murkkit blinked at everything as Finchpaw came up beside him and asked what he thought. "Big. Very big." Was the first thing that came into his head and out of his mouth as he gazed up at the sky above, so wide, even though it was dark-ish. He had never been so exposed in his life, and it made him feel small. So he made an effort to shove it away by drawing himself up to seem bigger. Empty sky's not going to scare me. Deliberately, he looked away from it and sat down, attempting to copy Finchpaw by wrapping his tail around his legs as much as he could. Following the other tom's gaze, he could see a cat about the same size as the other tom, and a huge one that looked a little strange. He narrowed his eyes and hunched down a little, as if to avoid notice. "Who's that?" Finchpaw followed the kit's gaze to the gray and white warrior, and watched as Murkkit huddled down. "That's my mentor, Ryecloud." Finchpaw stated, giving the warrior a nod. He leaned closer to Murkkit to whisper, "Although he does look a little busy..." Not wanting to bother Ryecloud, Finchpaw rose to his paws once more and began padding over to the fresh-kill pile, turning his head to see if Murkkit was following. "I never did ask Ryecloud what happened to his leg and jaw." The apprentice breathed, noticing the kit was staring. "Perhaps it was from a battle, or maybe he was just born with it. Either way, I find him to be an honorable fellow." The orange and white tabby stopped by the fresh-kill pile, eyeing a small mouse on the bottom. The right size for a kit... "Murkkit? Have you ever had fresh-kill?" Murkkit continued staring at the other tom, noticing his strange jaw and odd-looking hind leg as Finchpaw pointed them out. He glanced at Finchpaw as the other started moving towards a pile of limp... things that had fur on them. He'd seen the cats in the bush he stayed in eating them - for some reason - but now they were just lying on the ground? He relaxed a little as Finchpaw mentioned that Ryecloud was a good cat, but continued curiously following the other with his eyes. Then the tom asked him if he'd ever eaten "fresh-kill". He blinked. "No. What's fresh-kill?"